Published on March 12, 2019 in Daily Dirt, Michigan Contractor & Builder and National. Closed Tags: asphalt, bridges, construction, contractors, economy, employment, equipment, Federal Highway Administration (FHWA), Federal Highway Trust Fund, heavy equipment, infrastructure, Interstate Highway System, jobs, National Highway Traffic Safety Administration (NHTSA), pavement, roads, safety, the American Association of State Highway and Transportation Official (AASHTO), the American Road & Transportation Builders Association (ARTBA), The Bureau of Transportation Statistics (BTS), the Congressional Budget Office (CBO), the Michigan Department of Transportation (MDOT), the Michigan Transportation Asset Management Council (TAMC), the Texas Transportation Institute (TTI), the U.S. Census Bureau, TRIP. 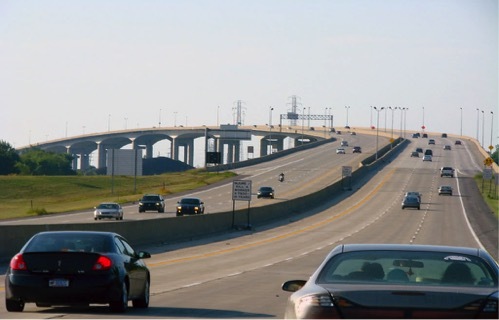 While increased transportation funding provided by Michigan’s 2015 road funding package has allowed many projects to proceed throughout the state, additional investment is needed to complete numerous projects that would improve Michigan’s road and bridge conditions, relieve traffic congestion, and enhance traffic safety and efficiency. 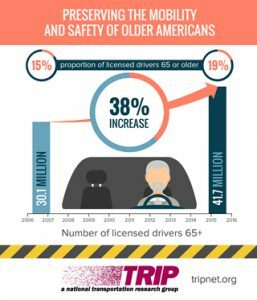 This isaccording to a new report from TRIP, a national transportation research nonprofit based in Washington, DC. Passage of the 2015 road funding package will increase state funding for local roads and bridges, state roads and bridges, and transit from $2.2 billion in 2015 to nearly $3.7 billion in 2023. The additional transportation funding has allowed the state to move forward with numerous projects that otherwise may have remained unfunded, though many projects across the state will not move forward without additional transportation funding. The TRIP report includes a list of projects across the state that are either underway or will be underway or completed no later than 2023, and a list of projects that currently lack adequate funding to proceed. The efficiency and condition of Michigan’s transportation system, particularly its highways, is critical to the health of the state’s economy. 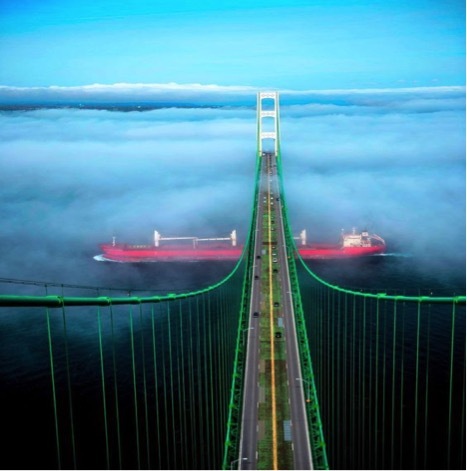 Annually, $1 trillion in goods are shipped to, from and within sites in Michigan, relying heavily on the state’s network of roads and bridges. Increasingly, companies are looking at the quality of a region’s transportation system when deciding where to re-locate or expand. Regions with congested or poorly maintained roads may see businesses relocate to areas with a smoother, more efficient and more modern transportation system. A decade after suffering a significant economic downturn, Michigan is recovering, with its population and economy growing and vehicle travel increasing in response to the growth. But the state’s rate of recovery could be slowed if Michigan is not able to provide a modern, well-maintained transportation system. The pace of economic growth, which will be greatly impacted by the reliability and condition of the state’s transportation system, continues to have a significant impact on quality of life in the Great Lakes State. With an economy based largely on agriculture, manufacturing, technology, natural resource extraction, and tourism, the quality of Michigan’s transportation system plays a vital role in the state’s economic growth and quality of life. In late 2015, Michigan’s governor signed into law a transportation funding package that relies on a combination of increased user fees, registration fees and general funds. While this increased funding will allow the state and local governments to move forward with numerous projects to repair and improve portions of the state’s transportation system, the funding is not sufficient to fully address the significant deterioration of the system, or to allow the state to provide many of the transportation improvements needed to support economic growth. Achieving the state’s goals for a modern, well-maintained and safe transportation system will require staying the course with Michigan’s current transportation program and increasing transportation investment. 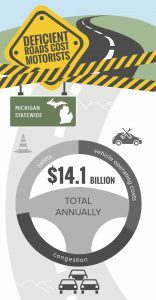 Driving on Michigan’s transportation system costs the state’s motorists a total of $14.1 billion every year in the form of additional vehicle operating costs (VOC), congestion-related delays and traffic crashes. 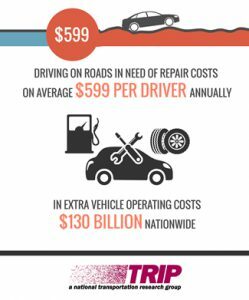 Driving on rough roads costs Michigan motorists a total of $4.6 billion annually in extra vehicle operating costs. These costs include accelerated vehicle depreciation, additional repair costs, and increased fuel consumption and tire wear. Based on research indicating that roadway design is likely a contributing factor in approximately one-third of serious and fatal traffic crashes, TRIP estimates that the economic costs of serious and fatal traffic crashes in Michigan, in which roadway design was likely a contributing factor, is $3.9 billion per year. These costs come in the form of lost household and workplace productivity, insurance and other financial costs. Traffic congestion costs Michigan motorists a total of $5.6 billion each year in the form of lost time and wasted fuel. The chart below details the average cost per driver in the state’s largest urban areas and statewide. Additional transportation funding provided by the state legislature in 2015 will allow MDOT to complete numerous needed projects throughout the state. While the additional dollars have been helpful, many needed projects still remain unfunded. In late 2015, Michigan’s governor signed into law a road funding package that relies on a combination of increased user fees, such as gas taxes and registration fees, and allocations from the General Fund. As a result of the funding increase, state funding for local roads and bridges, state roads and bridges, and transit will increase from $2.2 billion in 2015 to almost $3.7 billion in 2023. 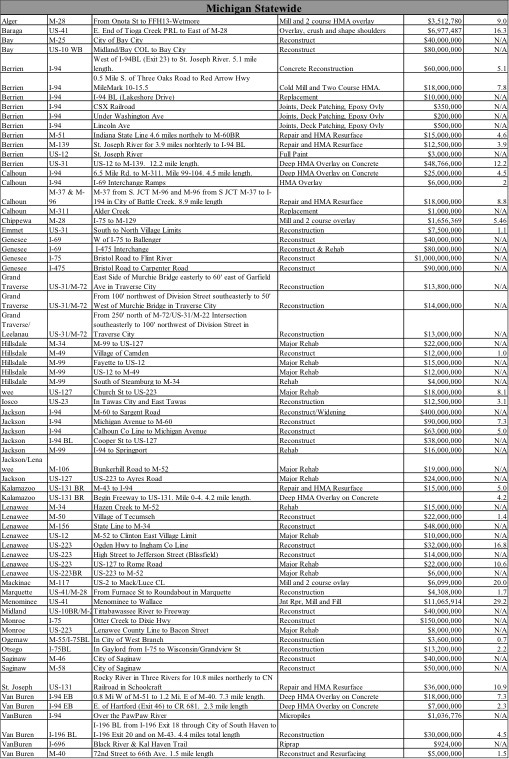 The chart below details the amount (in millions) of state funding for local roads and bridges, state roads and bridges, and transit. The 2015 transportation legislation provided an additional $484 million in transportation revenue in 2017, increasing to $649 million annually in 2021. The legislation also provided income-tax revenues for transportation starting in 2019. The income-tax revenue provided by the 2015 legislation is not dedicated in the state’s Constitution — as road-user fees are – and the appropriation could be changed.After 2020, income-tax revenues are expected to continue at $600 million per year, and the fuel-tax rate will rise with the Consumer Price Index after 2022. Additional transportation funding provided by the 2015 legislation will allow Michigan to move forward with numerous projects that otherwise may have remained unfunded. 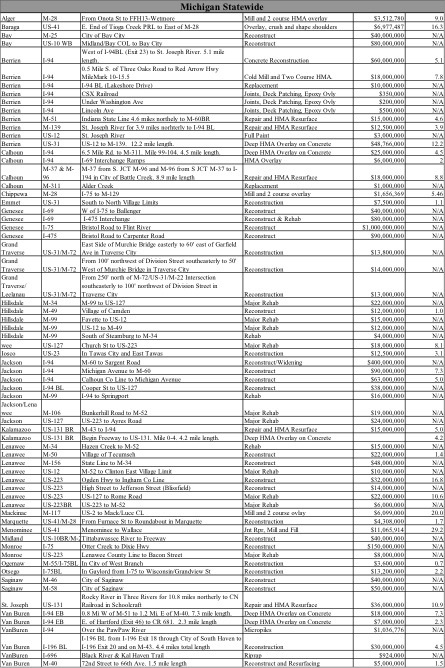 The list below details a sampling of projects in Michigan’s major urban areas and throughout the state that are either underway or will be underway or completed no later than 2023, partly due to increased revenue. Despite additional transportation funding provided by the 2015 legislation, numerous needed transportation projects in Michigan remain unfunded. 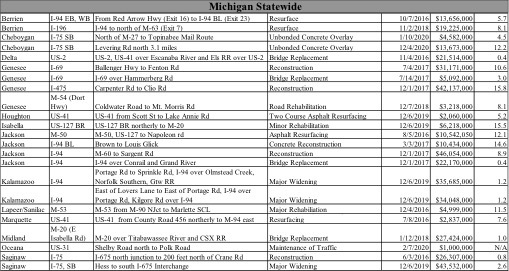 The list below details projects in Michigan’s major urban areas and throughout the state that currently lack adequate funding to proceed. Michigan’s population is again growing and nearing pre-recession levels after beginning to fall in 2005 and dropping each year until 2011. The state’s population has increased each year from 2011 to 2018 and is currently at 10 million residents. Michigan has approximately 7.1 million licensed drivers. After decreasing by 14 percent between 2000 and 2009, when adjusted for inflation, Michigan’s gross domestic product, a measure of the state’s economic output, increased by 21 percent from 2009 to 2017. Vehicle miles traveled (VMT) in Michigan increased by seven percent from 2013 to 2017, to 101.8 billion vehicle miles traveled in 2017. The share of Michigan’s major roads with pavements in poor condition has increased due to a lack of adequate state and local funding, providing a rough ride and costing motorists in the form of additional vehicle operating costs. The Michigan Transportation Asset Management Council (TAMC) found in its Michigan’s 2017 Roads and Bridges Annual Report that 40 percent of federal-aid eligible roads and highways in Michigan have pavements in poor condition, an increase from 2006 when 25 percent were rated in poor condition. The TAMC report found that under current funding the share of federal-aid eligible roads in the state in poor condition will decrease slightly by 2027 to 37 percent. One-in-nine locally and state-maintained bridges in Michigan show significant deterioration and are rated structurally deficient. This includes all bridges that are 20 feet or more in length. 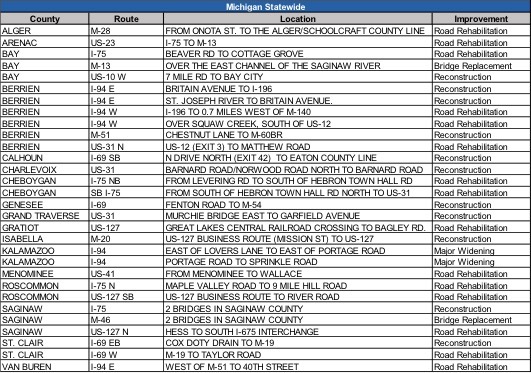 Statewide, eleven percent of Michigan’s bridges are structurally deficient. A bridge is structurally deficient if there is significant deterioration of the bridge deck, supports or other major components. Structurally deficient bridges are often posted for lower weight or closed to traffic, restricting or redirecting large vehicles, including commercial trucks and emergency services vehicles. The TAMC report found that under current funding the share of Michigan bridges rated in poor condition (which is a rating similar to structurally deficient) will increase from 10 percent in 2017 to 14 percent in 2027. 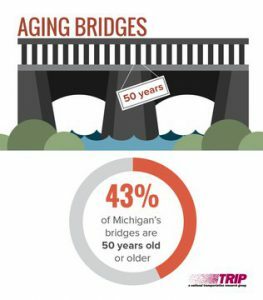 Forty-three percent of Michigan’s bridges (4,815 out of 11,180) were built in 1969 or earlier. Bridges 50 years or older often require significant rehabilitation or replacement. The Federal Highway Administration estimates that it would cost $607 million to replace or rehabilitate all structurally deficient bridges in Michigan. Increasing levels of traffic congestion cause significant delays in Michigan, particularly in larger urban areas, choking commuting and commerce. Traffic congestion robs commuters of time and money and imposes increased costs on businesses, shippers and manufacturers, which are often passed along to the consumer. 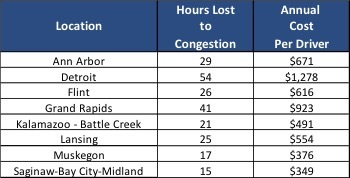 The chart below details the number of hours lost to congestion annually for the average driver in Michigan’s largest urban areas. It also includes the cost of congestion per motorist, in the form of lost time and wasted fuel. Improving safety features on Michigan’s roads and highways would likely result in a decrease in the number of traffic fatalities and serious crashes. A total of 4,905 people were killed in Michigan traffic crashes from 2013 to 2017, an average of 981 fatalities per year. Michigan’s overall traffic fatality rate of 1.01 fatalities per 100 million vehicle miles of travel in 2017 was below the national average of 1.16. The fatality rate on Michigan’s non-interstate rural roads in 2017 was nearly double that on all other roads in the state (1.55 fatalities per 100 million vehicle miles of travel vs. 0.83). 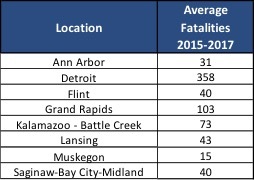 The following chart indicates the average number of people killed annually in vehicle crashes in Michigan’s major urban areas from 2014 to 2016. The efficiency of Michigan’s transportation system, particularly its highways, is critical to the state’s economy. A key component in business efficiency and success is the level and ease of access to customers, markets, materials and workers. The design, construction and maintenance of infrastructure in Michigan is a significant source of employment in the state. Annually, $1 trillion in goods are shipped to, from and within sites in Michigan, mostly by truck. Seventy percent of the goods shipped annually to and from sites in Michigan are carried by trucks and another 15 percent are carried by courier services or multiple mode deliveries, which include trucking. The design, construction and maintenance of transportation infrastructure in Michigan supports 94,107 full-time jobs across all sectors of the state economy. These workers earn $4.1 billion annually. Approximately 1.9 million full-time jobs in Michigan in key industries like tourism, retail sales, agriculture and manufacturing are dependent on the state’s transportation infrastructure network. As Michigan works to continue its economic recovery and build a thriving, growing and dynamic state, it will be critical that the state is able to address its most significant transportation issues by providing a well-maintained 21st century network of roads, highways, bridges and transit that can accommodate the mobility demands of a modern society. Michigan will need to modernize its surface transportation system by improving the physical condition of its transportation network and enhancing the system’s ability to provide efficient, safe and reliable mobility for residents, visitors and businesses. Making needed improvements to the state’s roads, highways, bridges and transit systems could provide a significant boost to the economy by creating jobs in the short term and stimulating long-term economic growth as a result of enhanced mobility and access. While the funding increase provided in 2015 will be helpful, Michigan still faces significant challenges in improving the condition of its roads and bridges and numerous projects to improve the condition and expand the capacity of Michigan’s roads, highways, bridges and transit systems will not be able to proceed without a substantial boost in state or local transportation funding. If Michigan is unable to complete needed transportation projects it will hamper the state’s ability to improve the condition and efficiency of its transportation system or enhance economic development opportunities and quality of life. 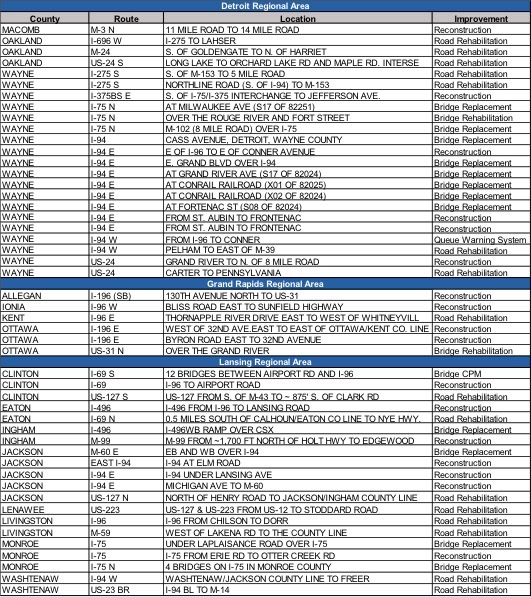 Sources of information for this report include the Federal Highway Administration (FHWA), the Michigan Department of Transportation (MDOT), the American Association of State Highway and Transportation Official (AASHTO), the Bureau of Transportation Statistics (BTS), the U. S. Census Bureau, the Congressional Budget Office (CBO), the Michigan Transportation Asset Management Council (TAMC), the Texas Transportation Institute (TTI), the American Road & Transportation Builders Association (ARTBA) and the National Highway Traffic Safety Administration (NHTSA). All data used in the report are the most recent available. Published on April 4, 2017 in Daily Dirt and Michigan Contractor & Builder. Closed Tags: asphalt, bridges, concrete, construction, construction industry, contractors, economy, employment, EPA, equipment, excavators, Federal Highway Administration (FHWA), Federal Highway Trust Fund, gas tax, heavy equipment, Highway Bill, highways, Interstate Highway System, jobs, pavement, roads, safety, the American Association of State Highway and Transportation Officials (AASHTO), The Bureau of Transportation Statistics (BTS), the Congressional Budget Office (CBO), the Michigan Department of Transportation (MDOT), the National Highway Traffic Safety Administration (NHTSA), the Texas Transportation Institute (TTI), the U.S. Census Bureau, transportation, TRIP, unemployment. Increased transportation funding provided by Michigan’s legislature in 2015 will allow the state to move forward with numerous projects to repair and improve portions of its transportation system; however, the funding is not sufficient to prevent further deterioration of the state’s roads and bridges or to move forward with $3.3 billion in needed projects, according to a new report released today by TRIP, a Washington, DC based national transportation organization. The TRIP report, “Modernizing Michigan’s Transportation System: Progress and Challenges in Providing Safe, Efficient and Well-maintained Roads, Highways and Bridges,” finds that even with the additional transportation funding- which is not guaranteed beginning in 2019 – state pavement and bridge conditions will decline. Traffic fatalities in Michigan increased significantly in the last two years and the state has experienced the eleventh highest rate of increase in vehicle miles of travel since 2013. As a result of the funding increase passed in 2015, state funding for local roads and bridges, state roads and bridges and transit will increase from $2.2 billion in 2015 to nearly $3.4 billion in 2023. The legislation will provide a total of $4.2 billion in additional funding through 2023, of which $2.3 billion from the General Fund is not guaranteed and will be distributed at the discretion of the legislature beginning in 2019. And, despite the recent infusion of funding, Michigan’s state-maintained roads and bridges are expected to continue to deteriorate. The condition of state-maintained roads is projected to deteriorate significantly over the next five years, with the share of lane miles in poor condition increasing from 20 percent in 2016 to 46 percent by 2020. The Michigan Department of Transportation (MDOT) estimates that, based on available funding, the number of state-maintained bridges rated in poor condition will increase by 50 percent between 2016 and 2023. Vehicle travel in Michigan has increased by 10 percent between 2013 and 2016 – the 11th highest rate of travel growth among states during this period. Michigan has also experienced a significant increase in traffic fatalities over the last two years, increasing 20 percent between 2014 and 2016. In 2016 traffic fatalities surpassed 1,000 for the first time since 2007. There were 876 traffic fatalities on Michigan’s roads in 2014, 963 in 2015 and 1,047 in 2016. The following statewide projects are either underway or will be underway or completed by 2020, partly due to increased transportation revenue in the state. The report also lists projects in Detroit, Lansing and Grand Rapids. The chart below details projects outside the state’s largest urban areas that will not move forward prior to 2020 due to a lack of transportation funding. The report also includes projects in Detroit, Lansing and Grand Rapids. Nine years after the nation suffered a significant economic downturn, Michigan is beginning to recover, with its population and economy starting to grow again and vehicle travel increasing in response to the growth. But, the rate of recovery could be slowed if Michigan is not able to provide a modern, well-maintained transportation system. The rate of economic growth, which will be greatly impacted by the reliability and condition of the state’s transportation system, continues to have a significant impact on quality of life in the Great Lakes State. In late 2015, Michigan’s governor signed into law a road funding package that relies on a combination of increased user fees, registration fees and general funds. While this increased funding will allow the state and local governments to move forward with numerous projects to repair and improve portions of the state’s transportation system, the funding is not sufficient to adequately address the significant deterioration of the system, or to allow the state to provide many of the transportation improvements that are needed to support economic growth. Achieving the state’s goals for a modern, well-maintained and safe transportation system will require “staying the course” with Michigan’s current transportation program and doubling down on this effort by obtaining additional increases in transportation investment. Michigan’s economy is beginning to recover following the Great Recession, with population, employment levels and vehicle travel approaching or surpassing pre-recession levels. The level of access and mobility will be a key factor in rebooting and growing the state’s struggling economy. Michigan’s population is again growing and nearing pre-recession levels after beginning to fall in 2005 and dropping each year until 2011. The state’s population has increased each year from 2011 to 2016 and is currently at 9.9 million residents. Michigan has approximately 7.1 million licensed drivers. After falling significantly during the recession, vehicle miles of travel (VMT) have surpassed pre-recession levels and continue to increase. Between 2013 and 2016, vehicle miles of travel in Michigan increased by 10 percent – the 11th highest rate of increase nationally. Michigan’s unemployment rate has returned to pre-recession levels. After beginning to rise in 2005 and peaking at 14.9 percent in mid-2009, the state’s unemployment is currently 4.9 percent. A lack of adequate funding has left one-fifth of Michigan’s state-maintained roads and highways with pavement surfaces in poor condition. Despite recent action by Michigan lawmakers to increase transportation funding, the condition of state-maintained roads is projected to deteriorate significantly over the next five years. The Michigan Department of Transportation (MDOT) estimates that 20 percent of state-maintained roads are in poor condition in 2016. Despite the increased funding made available by Michigan lawmakers, the condition of state-maintained roads is projected to deteriorate significantly over the next five years. While the additional funding has been helpful and has prevented a more precipitous decline in conditions, it is not sufficient to improve the condition of the state’s roads and highways or even maintain their current condition. The number of lane miles of state-maintained roads in poor condition is projected to increase significantly in the next five years, with the share of lane miles in poor condition increasing from 20 percent in 2016 to 46 percent by 2020. 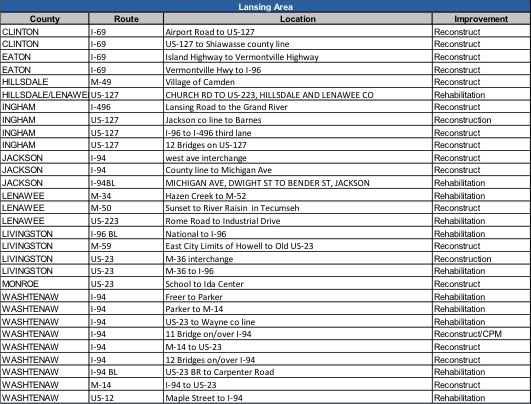 Approximately one-in-nine locally and state-maintained bridges in Michigan that are 20 feet or more in length show significant deterioration and are in need of repair. The share of state bridges that are deficient is expected to increase at current funding levels. 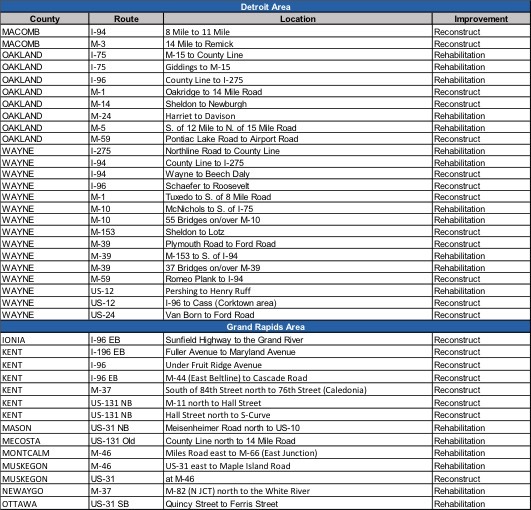 Eleven percent of Michigan’s bridges are structurally deficient. A bridge is structurally deficient if there is significant deterioration of the bridge deck, supports or other major components. Structurally deficient bridges are often posted for lower weight or closed to traffic, restricting or redirecting large vehicles, including commercial trucks and emergency services vehicles. 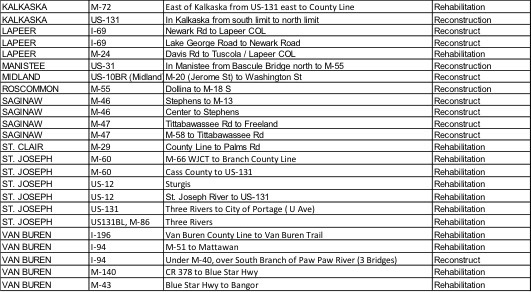 MDOT estimates that, based on available funding, the number of state-maintained bridges rated in poor condition will increase by approximately 50 percent from 236 bridges to 354 bridges between 2016 and 2023. Traffic fatalities in Michigan have increased significantly for the last two years, surpassing 1,000 deaths in 2016, the first time since 2007. The number of traffic fatalities in Michigan increased 20 percent from 2014 to 2016. In Michigan, there were 876 traffic fatalities in 2014, 963 in 2015 and 1,047 in 2016. 2016 was the first year since 2007 that traffic fatalities in Michigan exceeded 1,000. The fatality rate on Michigan’s non-interstate rural roads in 2015 was more than three-and-a-half times than on all other roads in the state (2.19 fatalities per 100 million vehicle miles of travel vs. 0.59). Where appropriate, highway improvements can reduce traffic fatalities and crashes while improving traffic flow to help relieve congestion. Such improvements include removing or shielding obstacles; adding or improving medians and intersections; improved lighting; adding rumble strips, wider lanes, wider and paved shoulders; upgrading roads from two lanes to four lanes; and better road markings and traffic signals. Investments in rural traffic safety have been found to result in significant reductions in serious traffic crashes. A 2012 report by the Texas Transportation Institute (TTI) found that improvements completed recently by the Texas Department of Transportation that widened lanes, improved shoulders and made other safety improvements on 1,159 miles of rural state roadways resulted in 133 fewer fatalities on these roads in the first three years after the improvements were completed (as compared to the three years prior). TTI estimates that the improvements on these roads are likely to save 880 lives over 20 years. TRANSPORTATION FUNDING AND NEEDED TRANSPORTATION PROJECTS Additional transportation funding provided by the state legislature in 2016 will allow MDOT to complete numerous needed projects throughout the state. 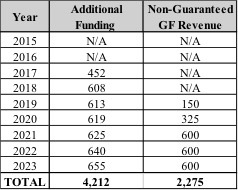 While the additional dollars have been helpful, many needed projects still remain on the drawing board due to a lack of available funding. In late 2015, Michigan’s governor signed into law a road funding package that relies on a combination of increased user fees, such as gas taxes and registration fees and allocations from the General Fund. As a result of the funding increase, state funding for local roads and bridges, state roads and bridges and transit will increase from $2.2 billion in 2015 to nearly $3.4 billion in 2023. The chart below details the amount (in millions) of state funding for local roads and bridges, state roads and bridges and transit. The 2015 transportation legislation will provide a total of $4.2 billion in additional funding through 2023, of which $2.3 billion from the state’s General Fund is not guaranteed and will be distributed beginning in 2019 at the discretion of the legislature. Additional transportation funding provided by the 2015 legislation will allow Michigan to move forward with numerous projects that otherwise may have remained unfunded. 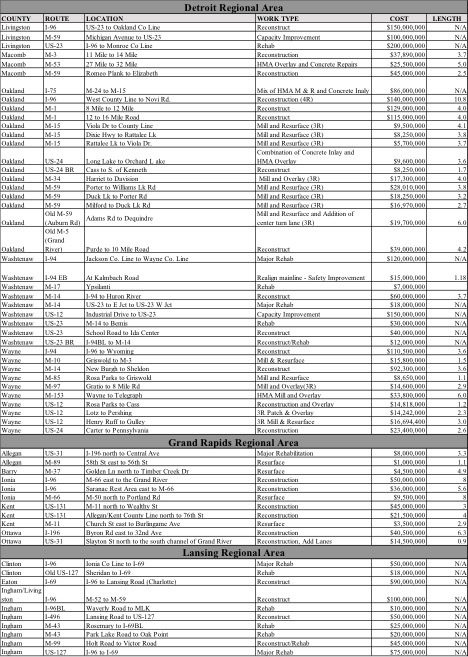 The list below details a sampling of projects in Michigan’s major urban areas as well as throughout the state that are either underway or will be underway or completed no later than 2020, partly due to increased revenue. Despite additional transportation funding provided by the 2015 legislation, numerous needed transportation projects in Michigan remain unfunded. 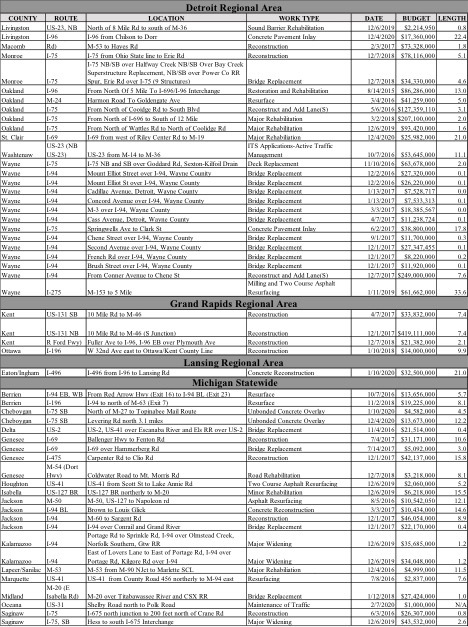 The list below details projects in Michigan’s major urban areas as well as throughout the state that lack adequate funding to proceed prior to 2020. The value of these needed transportation projects in Michigan that lack adequate funding to proceed is $3.3 billion, including $2 billion in the Detroit area, $483 million in the Lansing area and $234 million in the Grand Rapids area. Investment in Michigan’s roads, highways and bridges is funded by local, state and federal governments. 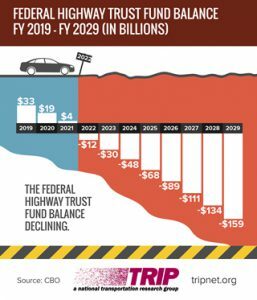 Signed into law in December 2015, the five-year federal surface transportation program includes modest funding increases and provides states with greater funding certainty, but falls far short of providing the level of funding needed to meet the nation’s highway and transit needs. The bill does not include a long-term and sustainable revenue source. The Bottom Line Report found that if the national rate of vehicle travel increased by 1.4 percent per year, the needed annual investment in the nation’s roads, highways and bridges would need to increase by 64 percent to $144 billion. If vehicle travel grows by 1.6 percent annually the needed annual investment in the nation’s roads, highways and bridges would need to increase by 77 percent to $156 billion. The efficiency of Michigan’s transportation system, particularly its highways, is critical to the health of the state’s economy. Businesses rely on an efficient and dependable transportation system to move products and services. A key component in business efficiency and success is the level and ease of access to customers, markets, materials and workers. Annually, $860 billion in goods are shipped to and from sites in Michigan, mostly by truck. Seventy percent of the goods shipped annually to and from sites in Michigan are carried by trucks. 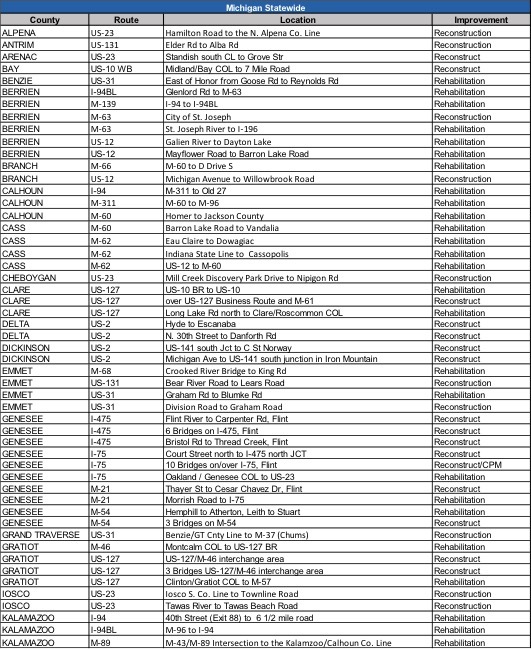 Sources of information for this report include the Federal Highway Administration (FHWA), the Michigan Department of Transportation (MDOT), the American Association of State Highway and Transportation Officials (AASHTO), the Bureau of Transportation Statistics (BTS), the U. S. Census Bureau, the Congressional Budget Office (CBO),the Texas Transportation Institute (TTI), the National Highway Traffic Safety Administration (NHTSA). All data used in the report are the most recent available.